I watched my mother lose her mind to dementia. in as little as four weeks! Mental decline used to be an “old person’s disease”. But terrifying research shows that roughly 9 out of 10 of American adults may be at risk of a syndrome that’s skyrocketing cases of cognitive decline, dementia and Alzheimer’s. In other words, the brain quite literally devours itself! And if that sounds scary, that’s because it is. And there’s a good chance it’s eating away at the future of your independence as you read this letter. Cerebral auto-cannibalism is what happens when your brain isn’t getting enough of one essential brain-fueling nutrient. So, rather than starve, your brain pulls the nutrient out of your nerve cell membranes. It’s the stuff of nightmares and horror movies—your brain literally eats itself. It starts slow—you might begin to feel more absentminded. Forgetting appointments, forgetting names, walking into a room and forgetting why you’re there. Over time, you might find yourself getting lost on routes you’ve driven hundreds of times. You’ve probably never even heard of this essential neural fuel. It’s never made mainstream news because most doctors have no idea how important it is. But, you’ll rarely see anything about this in the natural health community either. If a full 90% of adults are deficient,5 that means, even the healthiest diet does a bad job of feeding your brain this neural fuel. A lot of folks have moved to a vegetarian diet in the last few years, in hopes of improving their health. And in a lot of ways it’s working. But research shows, if you’re eating a vegetarian diet, you’re not getting anywhere near enough neural food. It has nothing to do with protein or B12—peas, beans and tofu won’t protect you. So, while most of your body appears to be in tip-top shape, you’re quietly starving your brain and skyrocketing your risk of cognitive decline, dementia and Alzheimer’s. And I’m not talking about McDonald’s or Burger King—even if you’re eating lean steaks, wild-caught salmon or free-range, organically-raised chicken, your brain still doesn’t get nearly enough neural fuel. So, I started researching today’s best multivitamins. I looked at the cheap one-a-days, the golds, the silvers, the A-to-zincs—none of them contain this vital neural fuel. Then I read the ingredients on the top three multivitamins, independently-rated, for overall quality. You can’t count on a healthy, balanced diet. And you can’t count on the highest-quality, most expensive multivitamins. But, the hard truth is, unless you start feeding your brain the one nutrient it craves the most, you’re putting your mind, memory, mental acuity—your very independence—in serious danger. …what can you do, starting right now? I’ll explain that shortly. But first I’d like to introduce myself. My name is Lee Euler, president of Green Valley Natural Solutions, and publisher of the brain health newsletter Brain Health Breakthroughs. I’ve spent the last 20 years uncovering both ancient remedies and modern, cutting-edge natural breakthroughs to help my readers overcome today’s most devastating health challenges. If you’ve ever watched someone you love slowly slip away into the grips of mental decline, then you know how devastating it can be—the confusion, the fear and the sadness is something I’ll never forget. I know from first-hand experience. I was forced to watch my mother, once a sharp, vibrant, ruler-of-the-roost, mentally disintegrate over the course of just a year or so. You can bet that after losing my mother to dementia I focused every shred of my energy on researching and understanding mental decline…why it happens, how we can halt, and even reverse, it. So when I started noticing lapses in my own memory in my 40s, my heart skipped a beat. 40?! I lost my mother when she was in her 70s. I knew 40 was far too young to start heading down the same road. I knew there had to be something more going on. And I was right. Acetylcholine lives in the synapses between your nerve cells. All of the things that Alzheimer’s and dementia slowly takes away. That means, correcting this deficiency—giving your brain the choline it needs to function optimally—can help halt cerebral auto-cannibalism. Maybe prevent and even reverse dementia and Alzheimer’s? Because I also learned that, between 30% and 50% of people thought to have Alzheimer’s, don’t actually have it. They have another problem attacking their brain function.19 And I’d bet my last dollar it’s actually cerebral auto-cannibalism at work. That includes eating itself—pulling vital choline stores from its very own cell membranes. Wreaking memory-stealing havoc on your mind, focus, concentration and, ultimately, your independence. A choline deficiency may be one of the major things that robbed my mother of her sharp-shooting, straight-talking intellect. But I’m certain it’s what was poking holes in my memory when I was an otherwise healthy man in my 40s. Because once I learned what was going on, I understood how to fix the problem. A shockingly simple solution that no one is talking about. us are dangerously deficient in such an essential nutrient? Over the last several decades, our diets have completely changed. So many of us eat fast-foods, pre-packaged, pre-made, processed, nutrient-stripped foods. It’s almost impossible to avoid. The grocery store shelves are absolutely packed with them! We get one aisle of fruits and veggies, one aisle for meats, and another for eggs and dairy. But we’ve already seen how little choline there is, even in these healthy, unprocesssed foods. But the rest of those aisles are lined with processed, nutritionless foods in bags, cans and boxes. Plus, our fear of cholesterol has fueled a brain-starving epidemic that’s sending our collective Alzheimer’s, dementia and cognitive impairment rates through the roof! Because the foods that DO offer ample supplies of choline are the high-cholesterol foods that mainstream America has been fooled into avoiding—I’m talking about things like egg yolks and beef liver. Even if you lined your plate with nothing but egg yolks and liver (yuck! ), women need at least 425 mg of choline a day. Men need 500 mg.
I’m a fan of eggs…but 3 to 5 a day is a lot for anyone. The more I explored this relationship between choline and cerebral auto-cannibalism, the more it became clear that it’s nearly impossible to get enough choline from food alone. But when I started researching the body of scientific journal articles on supplementing with choline, I never expected to see such staggering results. In study after study, people’s memory returned, their recall became sharper, their independence restored. In other words, they started to feel more like their “old selves” again. Remembering faces, remembering names and dates. Their relationships moved away from the challenges and confusion that come with cerebral auto-cannibalism, and back to the solid, grounded interactions they used to enjoy. And, perhaps most importantly…they were able to re-establish independence. But the evidence gets better. But perhaps the most exciting finding of all came from a three-week study where ten seniors took just 250 mg of choline a day. Their memory deficit improve by a whopping 157%!! The more I read about choline, the more relieved I felt. And through the dozens and dozens of clinical trials, not a single reported side-effect. Choline is just as safe as it is powerful. I read through pages and pages of research—it was clear I needed to give choline a try. And, from the very first week, my life was changed forever. Within days the brain fog lifted. I felt sharper, calmer, more focused—more confident. That was 12 years ago—I haven’t had a single worry about my mind or memory since. And now it’s time to feed your brain, halt your brain’s cannibalistic feeding frenzy and ensure a lifetime of confident , independent living regardless of your age or mental health. There are so many shady supplement manufacturers out there, it’s hard to know who you can trust for a high-quality supplement that does what it’s supposed to. Maybe you recall a few years ago when the New York Attorney General tested supplements from four of the top-selling national retailers. I couldn’t imagine spending my money on such snake oil. In short, this trademarked, high-potency choline can feed your brain, restore healthy cognitive function and ensure an independent lifestyle. A true godsend for anyone struggling with memory problems. 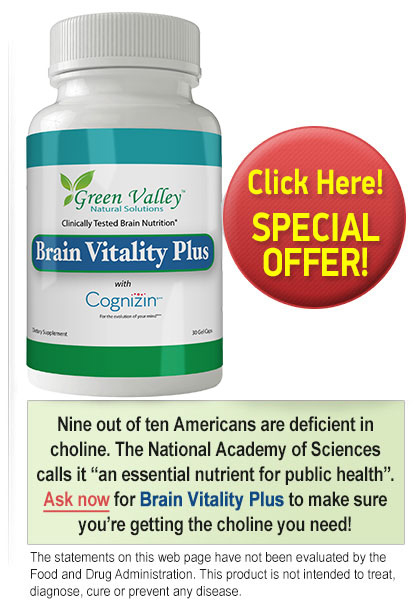 Brain Vitality Plus is the real deal. It’s called CDP choline and it’s the single-most bioactive form of choline Nature has to offer. Nothing but 100% pure choline in a form that your body can absorb and use quickly. We’ve added no stimulants, no fillers, it’s been independently tested for purity, potency and is guaranteed to be free of toxins or heavy metals. It’s gluten free, soy free, non-GMO, it ships directly from our FDA-inspected manufacturing facility, right to your doorstep. Studies have shown that choline can work its magic in as little as two weeks. For some people, even sooner. But even if you don’t notice a difference right away, just know that Brain Vitality Plus is flooding your brain with neural fuel, producing the vital brain chemicals that control thought, learning, memory, focus and concentration. As the days and weeks pass, you’ll feel clear-headed and focused. And with this renewed sense of confidence comes a vibrant energy—a spring in your step and a positive outlook that you might not have felt in years (or decades). Brain Vitality Plus isn’t for just anyone. This isn’t for Vegas gamblers trying to sharpen their card-counting skills. This is for people like you—people genuinely concerned about the future of their mental health and independence. This is for people who know what it looks like when someone they love slowly melts away from the inside—losing touch with their happiest memories and dearest connections. This is an honest-to-goodness solution, ensuring that your mind, memory and ability to live a vibrant life remain intact for years, even decades to come. And, unfortunately, a solution like this does not come cheap. But I recall how I felt when the New York attorney general reported his findings about all of those supplements. How all of those people spent their hard-earned money on fraudulent products that didn’t deliver on their promises. I’m going to send you a two month risk-free trial for 30 days. No strings attached. All I ask you to pay today is the shipping and handling—a modest $9.95.